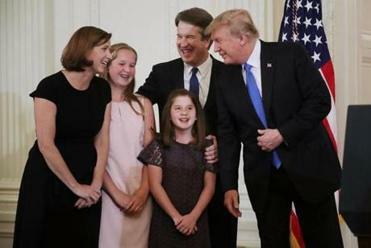 WASHINGTON — Abortion rights activists are desperately pinning their hopes on Senator Susan Collins, a moderate Republican from Maine, to join Democrats and block President Trump’s Supreme Court nomination of Judge Brett Kavanaugh in the weeks ahead. But a detailed review of Collins’s voting record reveals that she is anything but a maverick when it comes to the courts, consistently supporting nominees put forth by Republican presidents, indicating that activists and Democrats probably will be disappointed. During her 21 years in the Senate, Collins has voted for judicial nominees put forward by Republican presidents nearly 99 percent of the time, according to a Globe analysis of more than 500 of her roll-call votes for Supreme Court, circuit court of appeals, district court, and other judicial appointments. Since Justice Anthony Kennedy announced his retirement last month, Collins, who supports abortion rights, has been on a media tour vowing she won’t support a nominee who openly opposes Roe v. Wade, the landmark Supreme Court decision legalizing abortion. Kennedy, a conservative, has joined with liberal justices in decisions upholding the principles of Roe. Brett Kavanaugh is an Ivy Leaguer who worked for the justice he has been nominated to replace, investigated a Democratic president, and served in a Republican White House. As a candidate, Trump vowed to appoint judges who would overturn Roe v. Wade. If Kavanaugh proves to be strongly anti-Roe, it’s possible the Supreme Court could overturn the decision, allowing states to outlaw abortion once again. “I would not support a nominee who demonstrated hostility to Roe v. Wade, because that would mean to me that their judicial philosophy did not include a respect for established decisions, established law,” Collins said on CNN Sunday. Collins declined an invitation to the White House Monday night to observe Trump’s ceremony to unveil his nominee, adding another layer of intrigue to the confirmation machinations. But her voting record shows that Collins has supported all of Trump’s judicial nominees, including John Kenneth Bush, Trump’s nominee for the Sixth Circuit Court of Appeals who once described slavery and abortion as the “two greatest tragedies in our country” and compared Roe v. Wade to the infamous 1857 Dred Scott decision that ruled slaves could not be US citizens. The Maine moderate has also voted for many on the president’s Supreme Court short list when they were nominated for lower court positions, including Kavanaugh. Collins is facing enormous pressure from the left, as Senate Democrats face few options to stop Trump’s pick other than persuading her and Senator Lisa Murkowski of Alaska, another pro-abortion rights Republican, to join their slim minority. Democrats are hoping for a triumphant repeat of when the two women and Senator John McCain killed Republicans’ attempt to repeal the Affordable Care Act in 2017. Activists organizing on Twitter have even been sending wire coat hangers to Collins’s offices, a grisly reminder of an increase in illegal abortions that would probably occur if Roe were overturned. But Collins also faces political headwinds from her right. She needs to make it through a closed primary, in which only Republicans can vote, for her reelection bid in 2020, making opposing Trump dangerous. Carrie Severino, the policy director of the conservative Judicial Crisis Network group, which is spending millions on advertising to pressure Senate Democrats in red states to back Trump’s nominee, said she is not concerned about Collins. “At the end of the day, she’ll recognize that this judge has that judicial temperament [she is looking for],” Severino said, before the nomination was revealed Monday night. Still, some of the 1.2 percent of votes when Collins bucked a Republican president’s nominee were notable. Collins opposed two of Bush’s judicial nominees: William Pryor and J. Leon Holmes, who are both staunchly antiabortion. She was one of just three Republicans to vote against Pryor for a seat on the Eleventh Circuit Court of Appeals in 2005. At the time, Collins said she thought Pryor did not show enough respect for the judiciary. She also joined just five other Republicans in voting against putting Holmes on a US district court in Arkansas in 2004. Holmes was the president of Arkansas’ Right to Life group and had compared abortion rights advocates to Nazis. Collins also voted opposite most Republicans when she supported Helene White, a Bill Clinton nominee who was renominated by Bush to the Sixth Circuit Court of Appeals in 2008. Activists, desperate for a strategy to stave off Trump’s pick, see bright spots in her record. “We are hopeful that Susan Collins does not want her legacy to be putting somebody on the bench for the next 30 or 40 years who will undermine the things she has professed to fight for throughout her career,” said Daniel Goldberg, legal director at the Alliance for Justice, a liberal advocacy group. Goldberg said Collins was an “independent voice” when she voted against Pryor and Trump nominees Betsy DeVos and Scott Pruitt to lead the Department of Education and Environmental Protection Agency, respectively. “When there is a nominee that has made clear that they will vote to undermine Roe v. Wade, she has voted no,” Goldberg said. Out of the 503 judicial roll-call votes she has faced throughout her career, Collins has diverged from the average Republican’s just 45 times, or about 9 percent of the time. In most of those cases, Collins supported a judicial nominee picked by a Democratic president whom her colleagues shunned. She was one of just five Republicans to vote for President Obama’s Supreme Court nominee Elena Kagan in 2010 and one of nine who backed Sonia Sotomayor for the Supreme Court in 2009. When she’s bucked her party, it’s generally been to show deference to the executive’s right to pick his own judges. She’s bemoaned that judicial confirmations have become bogged down in politics. “The judicial branch is supposed to be above raw partisan politics,” Collins said on The New York Times’s Daily podcast last week.